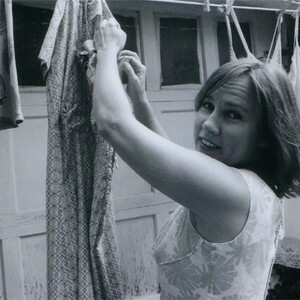 Iris DeMent (born 5 January 1961) is an American country/folk singer and songwriter. She was the fourteenth and last child of Pat DeMent and the sixth child of his second wife, Flora Mae. She was born near the town of Paragould, Arkansas but grew up in California, where she was exposed to and influenced by country and gospel music. DeMent writes songs about everyday experiences in simple language. DeMent writes songs about everyday experiences in simple language. Her first album, Infamous Angel, was released in 1992 and explores themes like religious scepticism, living in a small town, where "nothing good ever lasts", and forgiving human frailty. In her second album, My Life, released in 1994, she continues the personal and introspective approach. My Life was nominated for a Grammy in the "Best Contemporary Folk Album" category. Her third album, The Way I Should, released in 1996, tackles fiercely political topics like sexual abuse, religion, government policy, and Vietnam. After an eight year absence, she released Lifeline, a country-gospel collection.